In the sumptuous rooms and corridors of Chatsworth House is the house’s well known collection of classical sculptures that ranges from Egyptian figures to pieces by Antonio Canova, Bertel Thorvaldsen and Lorenzo Bartolini, as well as more recent pieces by 20th-century artists. They suit the resplendent architecture and interiors of the building, but do they too easily blend in with this grandeur? 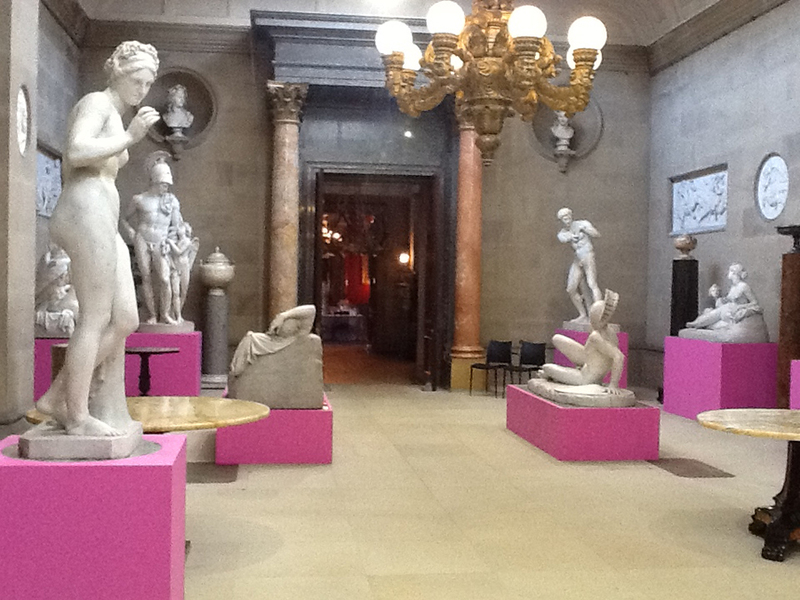 It was a question that guest curator Michael Craig-Martin asked himself when the Duke of Devonshire invited him to ‘fiddle about’ with Chatsworth’s world class collection. 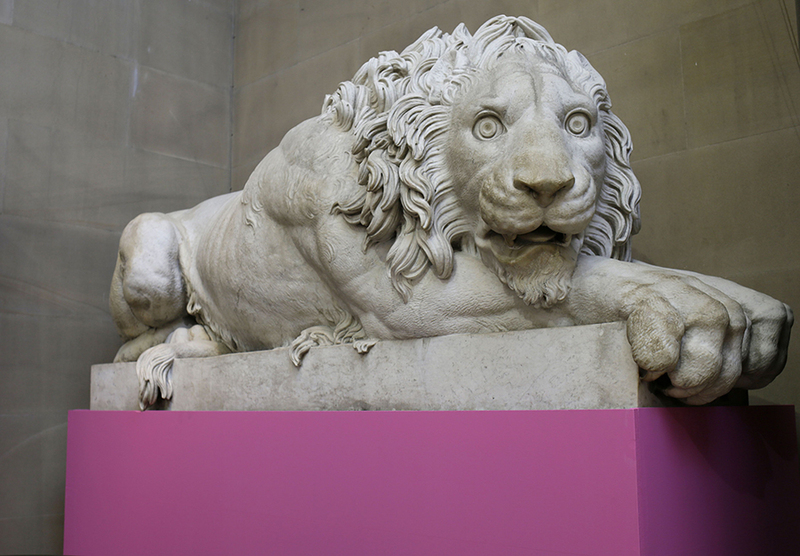 Craig-Martin admitted he was extremely nervous about the task with such a ‘challenging’ environment, but after taking tours with the Duke, he came up with the idea of placing magenta-coloured plinths underneath many of the full figure sculptures. 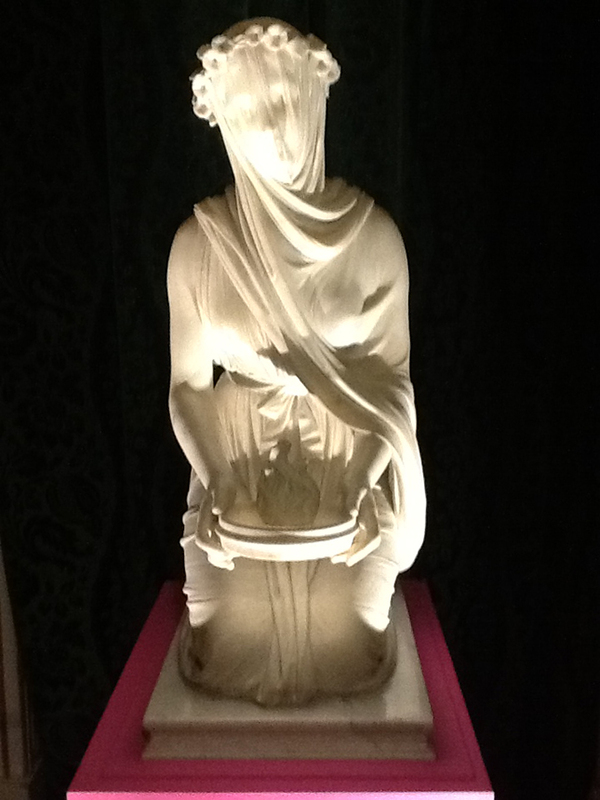 And so we find his bright plinths supporting a Roman figure of man (circa 100 AD), and under Canova’s A Seated Figure of Madame Mere c.1808 and Raffelle Monti’s stunning A Veiled Vestal Virgin 1846–7. The aim, as Craig-Martin tells us, is to focus our eye on these works – like magenta beacons, that apparently glow more brightly as dusk descends. It certainly works, even if the colour seems initially incongruous. 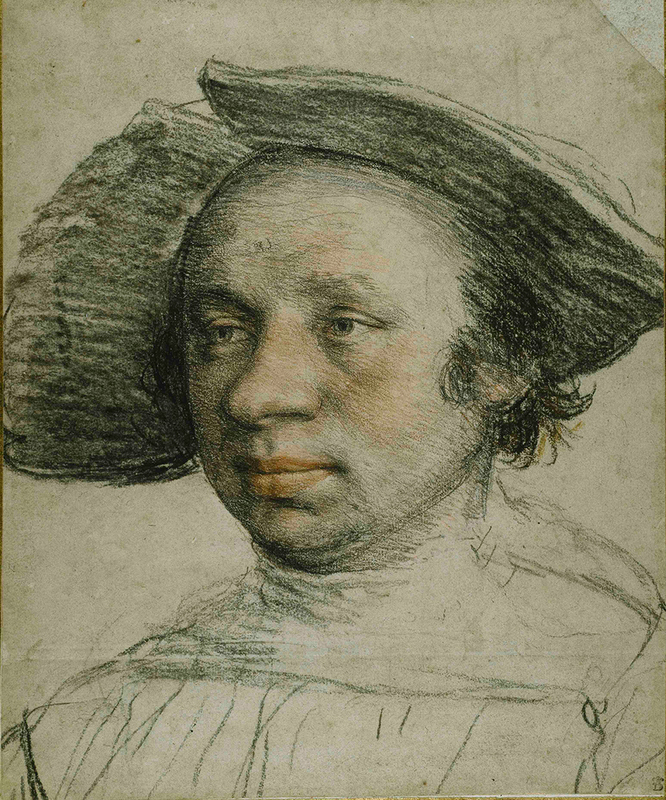 In addition to this, Craig-Martin has made a selection of Old Master drawings – Chatsworth has the finest selection beyond the Royal Collection. He had an eleven volume catalogue from which to choose and was immediately drawn to 13 large portrait heads from different periods, including pieces by Annibale Caracci, Carlo Dolci, Hans Holbein the Younger and Domenico Ghirlandaio. Displayed in a small darkened ante-chamber room, these heads, shown close up against each other are by turns, intense and very moving human studies. It is clear that Craig-Martin loved the experience of working with this collection, and who wouldn’t, but could you imagine a curator proposing these coloured plinths? Such a stance reflects how differently an artist can approach the curatorial challenge in comparison to a trained curator. It is clear that artists can more easily and freely ignore the embedded hierarchies of art history. They find it more natural to travel down curious art historical cul-de-sacs. They can joyously avoid traditional connoisseurship in their selecting, and probably spend more time actually looking at art than many. Some of the strongest exhibitions, I think, have been curated by artists, whose personal mind maps can open up new worlds of visual conversations. 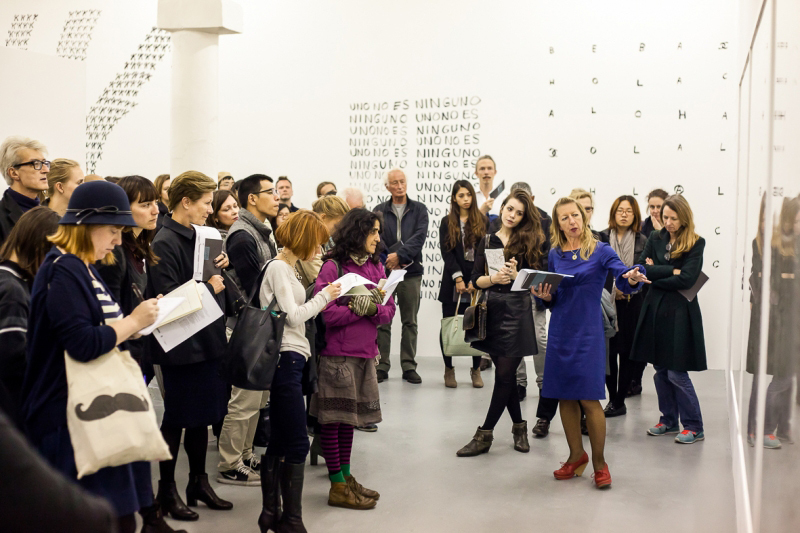 For example, Tacita Dean’s touring group show An Aside, Camden Arts Centre, 2005, reflected her nuanced interpretations of the connections that exist between art and artists from past and present. When else could you have you seen Paul Nash and Fischli & Weiss together? Mark Wallinger’s curated exhibition The Russian Linesman, Hayward Gallery, 2009, seamlessly interwove the work of George Stubbs, Robert Hooke, Bruce Nauman and Monika Sosnowska, whilst remaining to exude a sensibility of Wallinger’s own art, as did the multifarious works in Mark Leckey’s touring group show The Universal Addressability of Dumb Things, in which he grouped into ‘leaky typologies’ his selection of archaeological artefacts, objects and works of art. More recently, Richard Deacon gave us an addition to his show at Tate Britain with his selection of abstract drawings at the Drawing Room, London, with an enormously wide-ranging group of artists that reflected Deacon’s own interests in the nature of drawing - from the ethereal to the computer-generated. Here, for example, the poetry of typed words by Dom Sylvester Houedard shared a space with Mira Schendel - a subliminal conversation across the decades. Craig-Martin is himself, no stranger to curating exhibitions. In 1995 he curated Drawing the Line at Whitechapel Gallery, in which he showed that interesting drawings are not necessarily about connoisseurship or quality. Of course, the boundaries between artist, curator, art historian, and audience, are becoming increasingly blurred and interchangeable. As Polish artist Paulina Olowska noted recently: ‘It is my experience that the most rewarding practice is one that involves collaboration switching traditionally ascribed roles in order to navigate exhibition territory seamlessly.’ Perhaps this is the next step for Chatsworth? Abstract Drawing, curated by Richard Deacon, Drawing Room, London until 19 April. Richard Deacon at Tate Britain runs until 27 April. Thanks for your post and valid comment. Exhibition's like Fred Wilson's Mining the Museum I think are very important curatorial moments. My examples were all UK-based, and there are so many wonderful global examples I could have included - for example Thomas Demand's La Carte d'apres Nature at the Villa Paloma a few years ago, that was partly instrumental in introducing the art world to Luigi Ghirri's photographs. In fact I cut some of the examples out of my (very brief!) article. I think there is enough material out there to write a book on this topic.